America has an addiction: an addiction to buying Subarus. Over the past few years this great nation has been snatching up the Outbacks and the Foresters (and in the case of socially irresponsible people, the BRZs and the STIs) almost immediately after they roll off the assembly lines. But the people demand more: more seats, more space, more size. Subaru has finally answered the call. 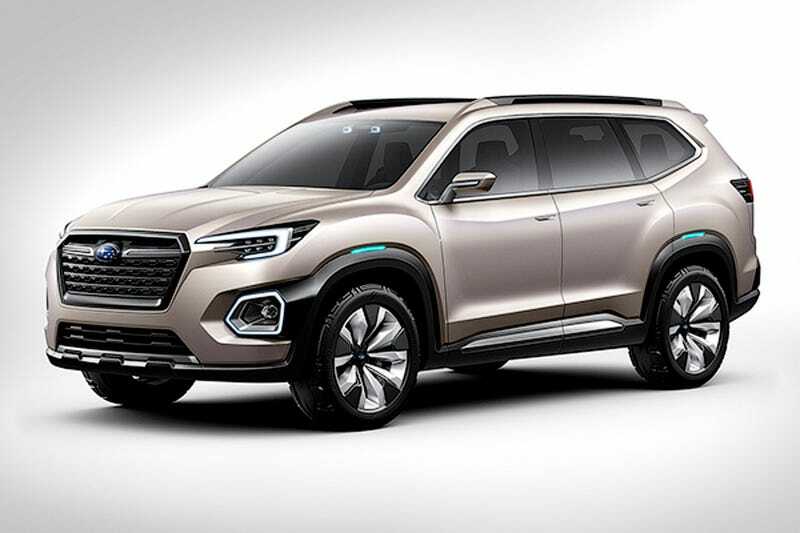 Set to be unveiled today at the Los Angeles Boring Crossover Show (it looks like somebody fucked up the embargo) is the Subaru Viziv-7 concept, and it’s the big seven-seat SUV America wants and needs so bad. Finally, a big Subaru! This thing is going to print money. Overall, it measures 204.7 inches (5.2 m) in length, 79.9 inches (2 m) in width and 72 inches (1.8 m) in height. Its wheelbase measures 117.7 inches (3 m), making the Viziv-7 some 15 inches (38 cm) longer than the current Outback. It’s also slightly longer, wider and taller than the VW Atlas, though their wheelbases are nearly identical. I almost feel bad for Volkswagen on this one. Finally, after so many years of getting trounced by Subaru, VW delivers the Atlas, the big crossover it hopes Americans will buy. And then BAM! Subaru comes out with a crossover that’s even bigger than that. I don’t know whose job it is at Subaru to professionally troll VW, but they are exceptionally great at it. More details on this concept as we get it. Yes, it’s a concept, but if you don’t think this thing is set for production in some form, I have a bridge to sell you!